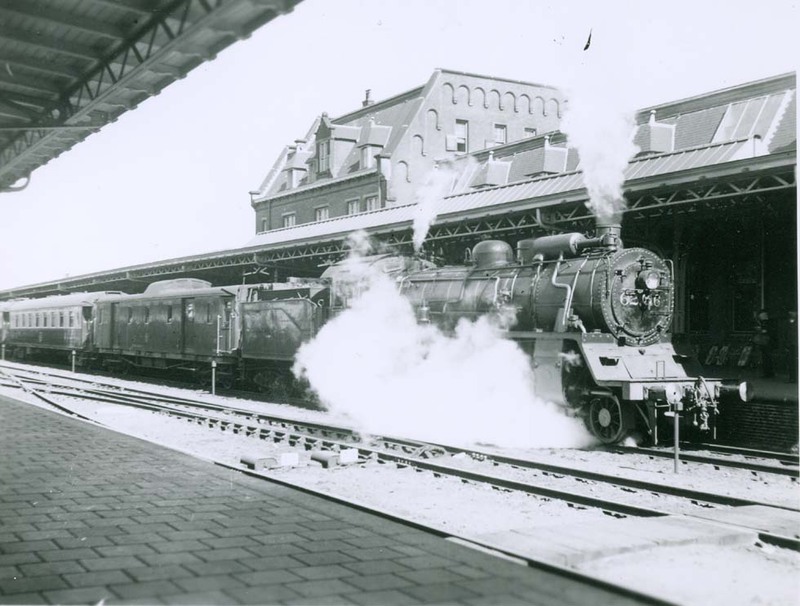 The de-Luxe "Pullman" day trains of the CIWL have their own history. After 1900 the company, over-expanded by luxury trains and its hotel chain, suffered horrendous losses. The banks together with director Davidson Dalziel wanted to buy out CIWL founder Georges Nagelmackers. Dalziel's daughter had married Nagelmackers' son Rene and he, with the help by the famous banker J.P. Morgan, met the U.S. steel magnate Mr. Schwab, who finally saved Wagons-Lits and Dalziel. The first all-steel sleepers subsequently were ordered in the USA, but due to WWI not built (see Repas Bleu, issue 45). Davidson Dalziel, then Lord Dalziel of Wooler, secretly acquired the British Pullman Palace Car Co. in 1908 and after WWI he was Chairman of the Pullman Car Co. (PCC) in England as well as President of CIWL and in 1928 his CIWL acquired Cooks (now Wagons-Lits belongs to the Accor Hotel Group). 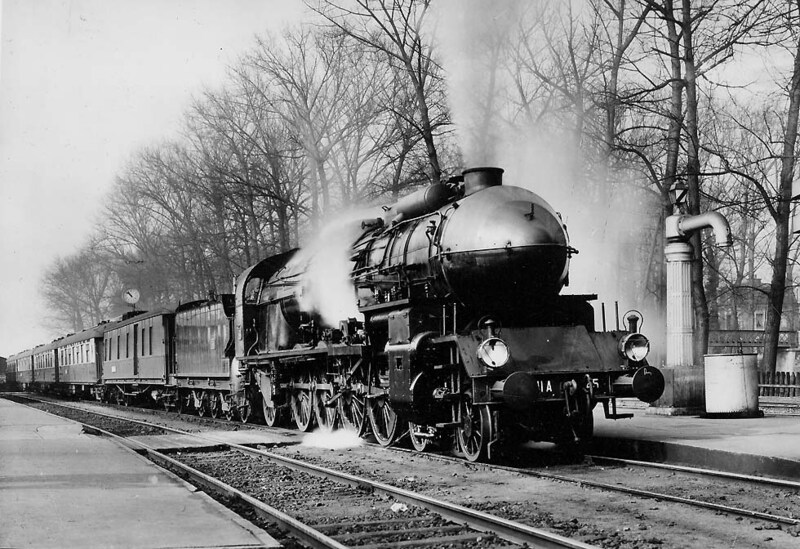 In winter 1925 CIWL started the Milan-Cannes-Pullman-Express, consisting of PCC day saloons nos. 54 - 58, then used on the Milan-Venice-Pullman-Express and from 1927 in Egypt. Dalziel ordered new cars, financed by Dudley Docker, owner of the various Birmingham car factories. The Fleche d'Or started with those new blue/cream colored CIWL Pullmans, followed by a lot of similar de-Luxe day trains, most ones short-lived domestic services. Generally they consisted of one or two "couplages", 1st and then also 2nd class de-Luxe. A couplage meant one saloon car with kitchen and another one without. Italy was served by the Gotthard-Pullman Basle -/ Zurich - Milan. 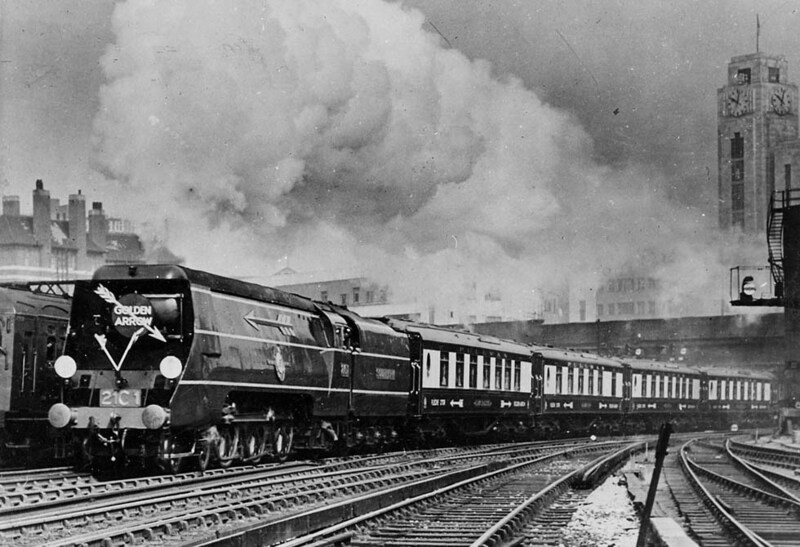 Like many Italian domestic "Pullman" trains it was not successful, running only between 1927 and 1931. 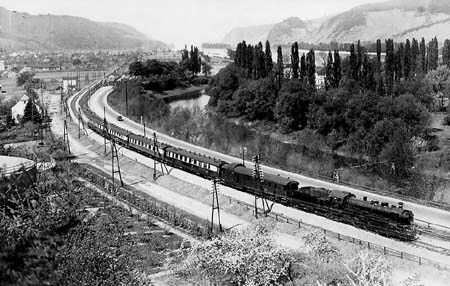 Apart from the Fleche d'Or, one of the successful Pullman trains of the CIWL was the Cote d'Azur-Pullman Paris - Menton. It started in winter 1929 and it was made up of 2 couplages of the new Cote d'Azur type and 2 vans, that means 6 cars. Temporarily a Pullman was refurbished as a dancing-car, but the noble clientele disliked it. Magnificent PLM Mountain engines stormed with the Cote d'Azur-Pullman through the Provence. The Edelweiss-Pullman Amsterdam - Brussels - Zurich/ Lucerne south of Basle was combined with Germany's prestige train, the Rheingold. That was the competitor of CIWL! It started in 1928 and it connected Hoek van Holland with Basle and temporarily Lucerne. 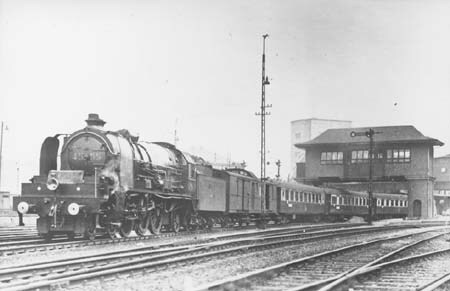 There was a section from Amsterdam and a connection from London by LNER's Hoek Continental. The DR cars' arrangement resembled the CIWL Pullmans, but they had a quite different design and the paint scheme was violet/cream. Mitropa provided the excellent service. Traction in Holland was by tenwheelers of the 3900 class, in Germany by Pacific series 185, 183, then 01, black with red wheels, and in Switzerland by the dark-green Ae4/7 electric engines. 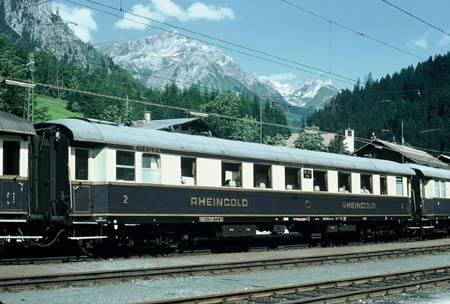 In 1939 two Rheingold saloons and a van were scheduled to Milan in combination with trains RM/MR. For future a classic dining-car service and dome cars were considered. 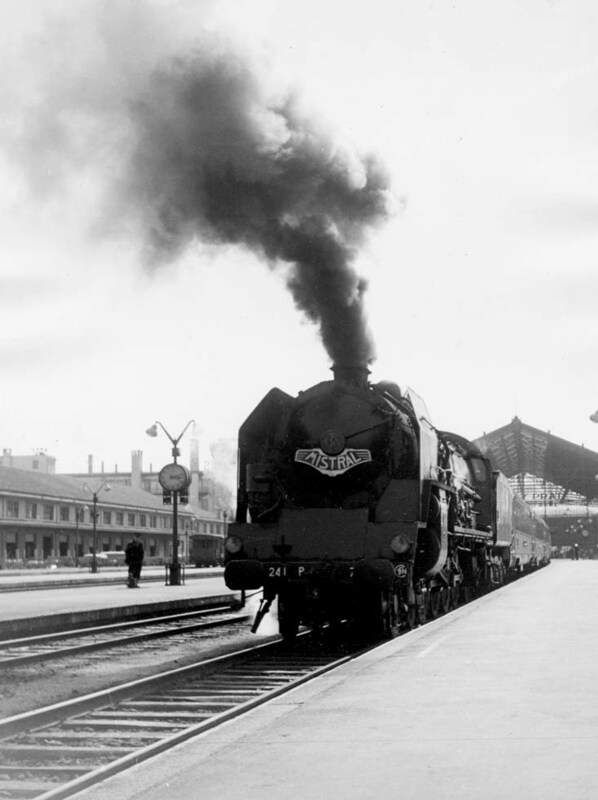 With World War II the short-term story of the Pullman trains in Europe ended. 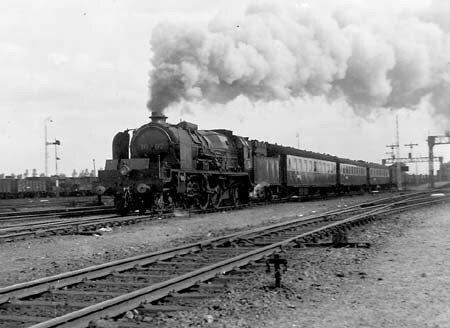 Many CIWL saloons of the Fleche d'Or and the 2nd class Etoile du Nord type became dark-blue diners, some ones continued services with other trains and one of them was the Rapide Paris - Marseille. In 1952 it became the Mistral Paris - Nice, the pride of French railways SNCF, between Paris and Dijon the fastest train of the world. On the 1.5 kV dc section it was hauled by the 2D2-9100, then the CC7100 and the BB9200 series. In the south it was steam-hauled by 241P Mountains and beyond Marseille by the 141R. After extension to Nice came the new stainless cars, built under Budd license, and always there were blue CIWL diners and one of the blue/cream colored Pullman saloons 4151, 4161 or 4163 of the Cote d'Azur type. With the green/turquoise CC7100, styled by sculptor Paul Arzens, the Mistral became a symbol for speed and progress. And the four-cylinder compound 241P, developed from PLM's 241C by engineer Chan, was among the last highlights of steam. The olive/black giants had an easy ride with the train, rolling smoothly at 140 km/h through the Provence, its stainless steel cars sparkling in the afternoon sun, unforgettable to everybody who had that experience. 1 generator van, 1 Pullman Cote d'Azur, 1 Restaurant, 3 1st class, 1 1st class with bar, 1 1st class Nice - Paris, 3 1st class Marseille - Paris, 1 Restaurant, 4 1st class Lyon - Paris. Colors: CIWL Restaurant dark-blue, CIWL Pullman dark-blue/cream, SNCF 1st class stainless, SNCF van dark-blue. Traction: 141 R Nice - Marseille, 241 P Marseille - Avignon (after reversal), BB9200 Avignon - Paris. George Behrend: Pullman in Europe. George Behrend: Pullman and the Orient Expresses. Jean-Paul Caracalla: Le Gout de Voyages. Alban Guizol: La Compagnie Internationale des Wagons-Lits.